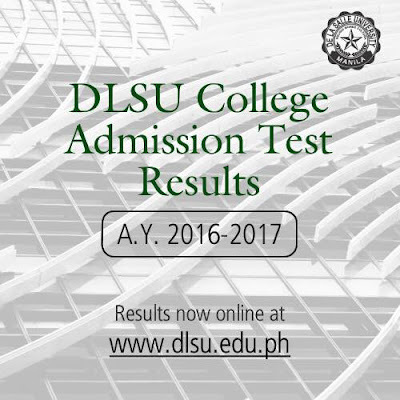 MANILA, Philippines - The De La Salle University (DLSU) College Entrance Test (DLSUCET) or DLSU College Admission Test (DCAT) results for academic year AY 2016-2017 were officially released on Tuesday, February 16, 2016. Results page (to include list of passers) is now available online. The reference number and complete name of the freshman applicant will be required to access the official DCAT results. Applicant Inquiry Form will be available for the takers to search their name if included in the list of DCAT passers. 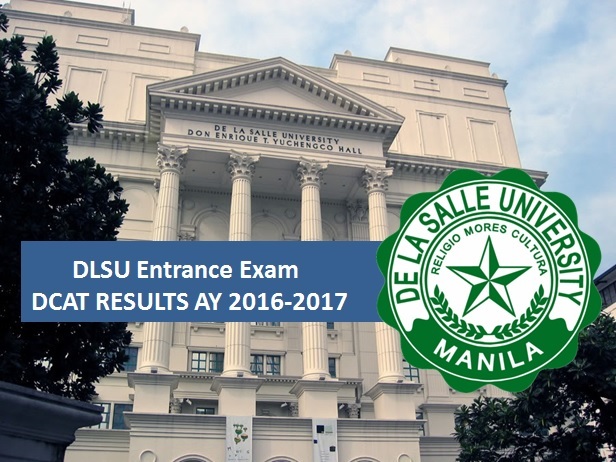 The examination was administered by the Office of Admissions on January 17 and 24, 2016 in DLSU-Manila and external testing centers. The procedure and requirements for FRESHMAN Confirmation is available here. DLSU said that for academic year 2016-2017, the first term will start on August 29, 2016. De La Salle University (also referred to as DLSU or La Salle) is a private Lasallian university in Taft Ave., Malate, Manila, Philippines. DLSU is known by the Philippine Commission on Higher Education (CHED) as a "Center of Excellence" in six of its programs, and a "Center of Development" in 3 of its programs. The university is also among the 40 institutions granted autonomous status by CHED as of 2010. Likewise, it is the first of the only two institutions granted the highest-level accreditation (Level IV) by the Philippine Accrediting Association of Schools, Colleges and Universities (PAASCU). The university ranks 142nd and 601+ in the 2012 Asian University Rankings and 2012 World University Rankings, respectively, published by Quacquarelli Symonds.